NEW YORK (February 25, 2016) – “Retail Technology’s Leading Lady” Deborah Weinswig, Managing Director, Fung Global Retail & Technology was one of seven retail professionals honored with Retail Leadership Award on the first day of the Asia Retail Congress, held February 19 and 20, 2016, at the Taj Lands End Hotel in Mumbai. 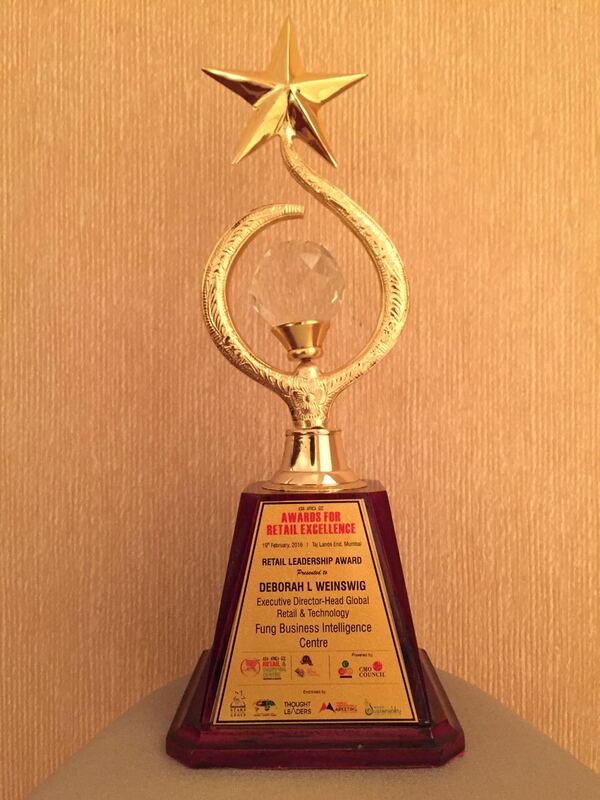 The award recognizes expertise, innovation and leadership in the Asian retail sector. The Asia Retail Congress was attended by the CEOs and Managing Directors of some of India’s largest companies in retail, such as Mahindra Retail, Crocs India, Reliance Jewels, Orra Fine Jewelry and Bombay Dyeing, and senior leaders from technology and consultancy services firms such as PricewaterhouseCoopers, Mindtree Limited, IBM India and Nielsen. An award-winning retail analyst and advocate for innovation, creativity and the implementation of cutting-edge technologies, Weinswig joined FBIC in 2014 to offer her unique viewpoints on the disruptive technology trends and innovations that are reshaping the global retail industry. Reports issued by FBIC include: “US Furniture Market Report,” “Holiday 2015 Takeaways,” “Online Consignment Market,” “Tech Enabled Holiday Shopping,” “Sizer App: The Online Fitting Technology Report,” “European C-Stores Report” and “Global Retail Loyalty Programs Report.” FBIC’s reports and analyses can be found at www.fbicroup.com and www.deborahweinswig.com. Fung Global Retail & Technology research team, based in New York, London and Hong Kong, is a think tank that follows emerging retail and tech trends, specializing in the ways retail and technology intersect, and building collaborative communities.